Basic steps on how to find your Italian Ancestors Records and how to request Documents from the Historical Archives in Italy and the USA by Paula Nigro. How to easily & freely find your Italian AncestorRecords. The only payment required is for copies of the Government Records here and in Italy. Eventually you may also want to make a donation to the Churches in Italy if you need to use their services and if there is someone on staff who is able to do lookups for you. No payment or donation is "required" to have ''professionals'' mail your letters or write them for you because YOU can do it yourself ! START WITH YOURSELF and go backwards in time generation by generation. Write down your name, your parents' names, your grandparents' names, your great-grandparents' names and anything else you know or can discover from relatives, including the names of the brothers and sisters of your parents, grandparents and so on. Finding records on your ancestors' siblings (collateral lines) will help you document your Family Tree. Write down everything you know or can find out about your ancestors especially significant dates of important events and places your ancestors lived... You will need to PROVE your Family Legends and Colorful Stories using Primary Source Documents from Italy and from the places where your immigrant ancestors migrated. Elders are Gold Dust in Genealogical Research. Visit, telephone or write all of your older relatives and ask them to help you fill in the blanks. Ask them if they know of anyone who might have additional information. Be sure to take notes and record the conversations if possible. Date each piece of information given to you & write down who gave you the information. Keep in touch with them. You must discover the exact place in Italy where your Italian ancestors were born. You need the name of the Italian comune (municipality, township) and Italian province. Your ancestors' last place of residence in Italy before they emigrated may NOT be where they were born. Once you find your valuable Italian Heritage information you will be able to gather your Italian Ancestry Documents from the correct municipality & province. Then you will be able to try to connect your Italian Family Tree (L'Albero di Famiglia) to living family (cugini and parenti) related to your exact Italian Branch. Your Italian Ancestors' place of birth can be found on documents and records such as USA Immigration papers, Birth records, Marriage Records, Death Records, Census Records, Social Security Applications, Ellis Island or other Immigrant Ship Passenger Arrival Records, Naturalization Papers, Obituaries and some WWI and WWII draft cards. These documents are all very useful in discovering the birth place of your Italian immigrant ancestor. -- P L E A S E -- don't make the mistake of thinking someone in a microfilm or an online family-tree with the same surname and birth year and even born in the same village as your ancestor is necessarily part of your direct-line family branch. Italian first names and surnames of the grandparents of children are often given to grandchildren. For instance, a man with many sons might have had most, if not all, of the first born sons of his own sons named after him. Even though they would probably all be known by nicknames in daily life the Italian Civil and Church Records will only show the official given name. Discover How Easy It Is To Stay Organized. Make it easy on yourself to hang-on to your own Family Tree Information whether or not you have an Internet Connection by using any of the free genealogy record keeping tools, such as charts, family group sheets and extraction forms available on the Internet. Keeping your Italian Genealogy Research on your own computer and saving it to Cds, DVDs and simply printing it out to save for future reference is what you need to do so that YOU OWN YOUR FAMILY TREE RESEARCH and have not simply placed it someplace online that might not be there in 10 years. Ownership of your own work in your safe-keeping not just on some site someplace also makes it simpler to pass along to your relatives and their future generations. We are blessed that the "Mormons" (Latter Day Saints) have filmed some of the Italian Civil Records for many of the comuni (municipalities, towns, villages) in Italy and are putting many of them online. GO in and talk to one of their genealogy volunteers. Tell them you are researching your Italian Family Tree and would like to pick up their free genealogical forms and research guides. They had a *very* inexpensive guide to doing Italian Genealogy Research, an Italian Genealogy Work List and more. If they no longer have any printed information ask if they will print something for you from their online guides. If you are Home-Bound and/or unable to drive to one of their centers these *Classic LDS Family History Guides* will help you very much. Keep them for future reference. You can use them whether or not you have an Internet-Connection - and *many* lose their internet connections due to the economy and/or many are giving up computers, due to the constant push by heart-less companies to force and manipulate everyone to upgrade their computers and programs constantly (planned obsolescence) - to make more money for the decadent elites. Family Search (connected to the LDS church "Mormons") placed some of their holdings online for FREE. You will find ACTUAL IMAGES of ''some'' of the records in Italy. In some cases, though not all, you can see these images by using your own home computer. SAD NEWS - Family Search (actually the heartless tech elites in their IT dept) no longer easily allow direct links to their collections so try to search for them the long way by clicking on this link. They ask for a sign-in (no biggie use a disposable email address) although at least once a year (usually more often) they will tell you that you have to upgrade your browser or get a new computer, probably so the Tech Elites can make some kind of monetary gain by selling their wares. Seriously and sadly, at this point, it might be much cheaper and easier for you to hire a professional Italian Genealogy researcher with connections in Italy. The Italian State Archives in Italy (Archivi di Stati) are in the process of putting their Italian Birth, Marriage and Death records Online. B R O W S E ~~the Digital Images of the civil records held and owned by the Italian State Archives for FREE. Archivi di Stato di Agrigento, Arezzo, Ascoli Piceno, Asti, Avellino, Bari, Belluno, Benevento, Bergamo, Brescia, Caltanissetta, Campobasso, Catanzaro, Chieti, Como, Cremona, Cuneo, Enna, Firenze, Forl�, Genova, Grosseto, Imperia, Imperia,sezione di Ventimiglia, Imperia,sezione San Remo, L'Aquila, La Spezia, Lucca, Macerata, Mantova, Messina, Modena, Napoli, Padova, Palermo, Pesaro, Pesaro-Urbino,sezione di Fano, Pesaro,sezione di Urbino, Pescara, Potenza, Prato, Ragusa, Reggio Calabria, Rieti, Roma, Salerno, Savona, Taranto, Torino, Trapani, Treviso, Udine, Venezia, Viterbo. N E V E R Trust an extract or a transcription of a document. Please try your *best* to find and view the actual document, or a transmittal from Italy, not someone's *version* of the record. It is never in your best interest, genealogically speaking, to trust a transcription. You need to see the actual record so you don't pass along incorrect information on your ancestors. I've even reviewed a transcription where the transcriber had a mother married to her son. The mistake made a big, scrambled mess for generations. 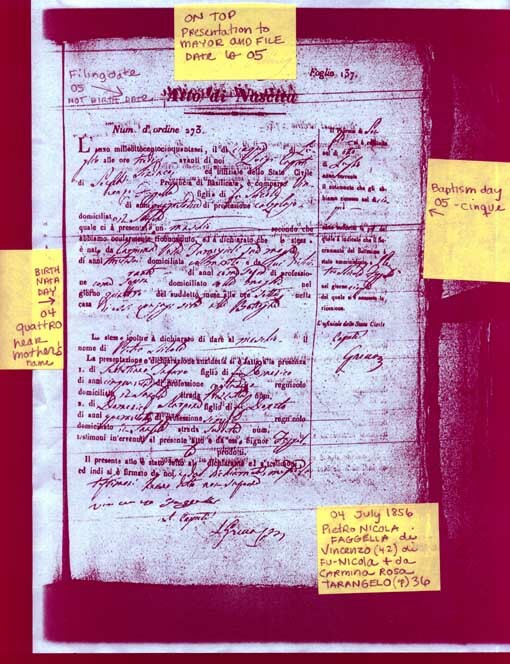 In addition some transcribers cannot read the old type of cursive handwriting. Besides incorrect spelling on their extractions some people confuse the date of presentation of a birth to the Mayor (or other comune official) as the infant's actual day of birth. The actual birth day of the baby on an Italian Birth Record is found near the name of the mother. Write to the Civil Record Offices, in the Italian Comune of Birth of your immigrant Italian Ancestor when trying to find your direct line immigrant ancestors if you find there are missing records in the Mormon Upload. *For instance* all of the 1864 Marriage Records for the Comune of San Fele are missing in the LDS upload although Italy still has them. The Italian Churches also have records on your family born in Italy going back to the early 1600s and in some cases back to the late 1500s. These days the churches are understaffed and do not usually have secretaries so in that case you need to visit in person. Dear People... In 5 or 10 years the links you added to your tree to prove you found some proof online will be gone or changed !!! The online link where you found an image or transcription proving your ancestor's existence and dates of events is a publication link only and can soon become obsolete and meaningless. However, IF you took good notes and retained digital images, photocopies, or print-outs of the births, marriages, deaths, photos of tombstones, censuses, draft cards, property records, newspaper articles, etcetera, you will still have your proof and a link will show where you originally obtained your valuable information... although it will not give the information if it is gone so save the information, for posterity, in a more traditional manner by writing it down or printing it to paper. Sadly, many publication links need to be abbreviated by removing the bloated tracking scripts added by all the commercial sites. Even the Mormons at FamilySearch now add them. Cut the Fat. Learn to trim links down to the shortest URL. Place the TRIMMED publication link into the "Publication Section" of each individual source note. A good FamilyTree programs will make it easy for you to cite your sources. It takes a little work and will make it possible for you to pass along your work to future generations and easily share with current relatives. Keep backup photocopies, printed images, digital images, etc. in your personal off-line files. A source is an image or excellent notes from something you have seen (like a family bible) that you have on file permanently and that you have typed into your notes for an individual. It should include the source author's name, the database location, the image number, and any other form of identification. SAVE YOUR TREES on your own computer or in your own file folders and make copies of anything digital and burn to your own Cds and DVDs. Give copies to relatives, keep copies in a safe deposit box, in your mom's attic, in a bag near the door in case you have to take off due to a hurricane, whatever!!! KEEP and Maintain YOUR Genealogy research and the proof of your ancestors' existence using simple Genealogy Record Keeping Tools. A computer "cloud" is NOT a magical place it's a data warehouse or warehouses with Servers (big computers) where you are renting space along with a bunch of other people ... They are big so they can hold millions and billions of people's stuff. Computer clouds waste HUGE amounts of energy, are wasteful and all the greens do is complain about incandescent light bulbs and other trivia when "Cloud" computing destroys the environment (especially wireless microwave heat) and eats up massive amounts of resources; just like SmartFones. The word "Cloud" in the computer world is a MARKETING TOOL. Computer "clouds" are vulnerable since outsourcing data storage increases the surface attack area. Even celebrities are waking up to that fact and deleting their "save it to the cloud" accounts. Apple Co-Founder Steve Wozniak says the cloud is a nightmare. So why bother using the "cloud" if you can avoid it? Most of us are just regular people, rank and file, the good folk, so backup (save) all your research once a month. Make copies of your work on DVDs, or CDs, or other Hard-Drives, or even just print stuff out and put it in acid-free archival sheets. Keep your work someplace safe and share with all your relatives. Genealogy researchers searching for ancestors who were born in the same town as your ancestors are very important. It doesn't matter if they share your surname. The information from this type of location specific connection is very valuable. Some researchers will know stories that will help you connect to fact. Some might even help you get records from the Italian comune office or church if they are going there on a visit. You might even discover that you are related to them. F Y I ... most of the records filmed by the Mormons are also available by writing to the Italian Province Archives / Archivio di Stato in Italy / Italia. So if a connection finds your ancestor in one of the Registries of Birth, Marriage or Death then you can write for a copy from Italy if it's too difficult to deal with blury online images and with familysearch constantly changing and restricting anything but thee "latest" GIZMO to access their site so it is compatible with the genealogy for-sale sites like Permira, Silver Lake Investments Leveraged Buyouts Partnership. The situation is **sad** for many genealogy researchers who simply want to practice their religion and are forced to upgrade their computers when many of the true believers have fixed incomes or are at poverty level and the last thing they should have to worry about purchasing is a new gizmo to access the familysearch site for the benefit of the partnership with the pay-to-view sites..
You can Use Italian Form Letters. The Italian Provincial Archives are equipped to answer genealogy requests. Many have Italian genealogists on staff and all of them have certified Archivists who will do simple retrieval if you give them enough information. They charge a minimum for Shipping and Handling back to you. If you are requesting a lot of research they may not do it or they charge for genealogical research. If you send them a simple request for photocopies of a certain record of a certain individual then the charge is about 3 Euros for 2 photocopies, shipping and handling. I have written to the Province Archive in Italy and received photocopies of documents including copies of Italian Military Records such as the "registro di leva" not available online. Once every year or so, "if" you have uncovered more information on your family tree, print out copies and send to your relatives. You don't have to send the entire thing... just the branch they are in. Ask for corrections. If there is a lot to send to someone then I use the USA Post Office FLAT rate envelope. It is very economical and makes it great from the elders who do not have computers. For some it is easier to share online, if your relatives have computers, although it is often simpler to print out from PAF using their print-reports tool and your relatives can make quick corrections right on the pieces of paper. Put your Familytree on a relatively Ad-Free free server offering free web space and use it for your family tree history. Personal Ancestral File (PAF) even has a WebPage Tool you can use to build your own WebPages. You will discover more relatives if you make your genealogical information available online in such a way that your tree can be easily accessed without forcing potential relatives to go through a red-tape sign-up to view or even WORSE pay-to-view which Ancestry Permira Private Equity Singapore Private Wealth Fund, MyHeritage and others now require with 'their' family-trees, which were given to them for FREE by their subscribers. Don't limit your ability to easily connect to people from all over the world who are doing research on your comune of interest by locking and trapping yourself into a pass-worded or pay-to-view database. Having to give a company your Credit Card Information just to view a Family Tree that was GIVEN TO THEM FREELY is basically a watered down Mafioso type of Extortion Racket. Upload your own family trees. It is not difficult to learn beyond a slight learning curve. You can teach yourself. Be Pro-active. You can do it if you try. The first step is to TRY. Go ahead, get going, Try, Try, Try . . .
A Primary Source is one that is proof positive that the person mentioned is the person you claim them to be. Primary sources are documents that were created at the time an event occurred like a birth, marriage or death date being recorded at the time of the actual birth, marriage, or death. A birth date on a death record is not a primary source it is a secondary source. A Secondary Source is one that is not actually proven but gives you a good clue. IMPORTANT NOTE: all Government and other 'official' records "may" still contain errors in spelling, dates, ages, and more. This is why it's smart to get about 3 records minimum (or more) for each person in your tree if possible. Most "Family Stories" or "Family Legends" contain a basic truth but are often "decorated" or contain misspellings or other problems of oral tradition. Collect primary source records to prove the stories. Most USA States have archived birth, marriage, divorce and death records at their Office of Vital Records since the early 1900s & a few have them from about 1880. Check this link: http://www.cdc.gov/nchs/w2w.htm If earlier records exist you would write to the County Recorder in the county where the event occurred. Contact the local City Hall where the event occurred as sometimes smaller cities & towns will provide you with copies from their office. Generally, the original Social Security Application will give your ancestor's place of birth and their parent's names including mother's maiden name. You can easily find the SS# on your ancestor's Official State Death Notice. The U.S. Social Security Death Indexes Online *rarely to never* have listing for people who died before 1962. Also, they only have the names of those deceased persons who had a SS# and obtained benefits or whose survivors applied for benefits against the Social Security Number holder and then the Social Security Administration must move the name and number to the Death Index list. Go to the USA Tools Page on this Italian Genealogy website for more information. Go to our USA-Tools resources links page for more info on various USA Records such as the U.S. Census, Cemeteries and Death Indexes and more. Everything you need in order to teach yourself to do Italian Family History Research or fundamental Genealogy Research can be found via our ItalianGenealogy Online homepage or linked to Genealogy Tools & Resources contents page. Read Steve Saviello's Tips: How to Research by Mail, What Italian Records are available, and which Archive in Italy has them. After you know exactly which comune (municipality) / comuni (municipalities) in Italy to write to, use any of the sample "Italian Genealogy Form Letters" you feel comfortable with, which are linked to the "Italian Genealogy Online - SITE MAP"
ITALIAN FORM LETTERS - in English & Italian - How to write a letter to Italy All the letters are in Italian with English underneath. Simply change the names and dates given as examples by replacing them with your own family names and dates. If you request an "estratto" from Italy it is the easiest to understand and receive. David's Italian Form Letters has an example of an Italian Form Letter requesting an estratto (estratti is plural) Usually there are more details in the photocopy of an image of an exact document of the original record. The problem is often a comune will not photocopy the record for you. However the Province Archive (Archivio di Stato) will do photocopies. If an Italian Archive sends you a copy of the original certificate in Italian go to the Italian Genealogy Translation Help-Aids webpage on this site and use the links to help you translate the Italian Record. 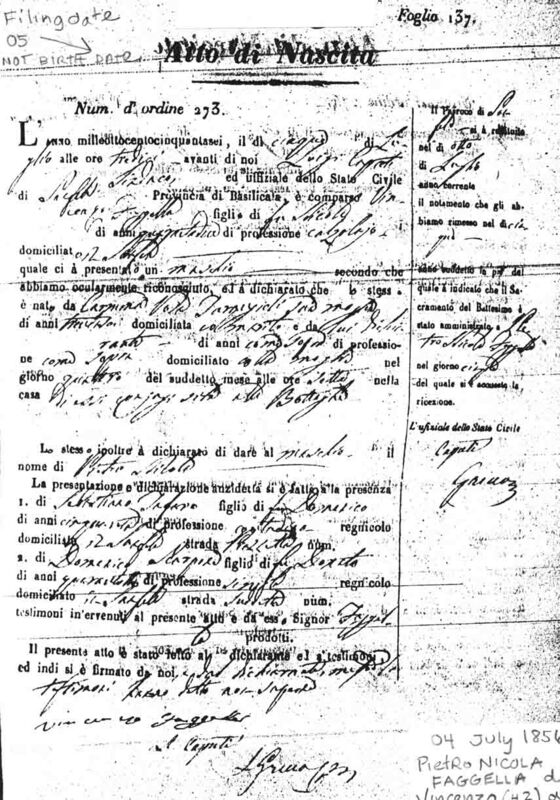 Most of the Civil Birth, Marriage and Death records are standard, simple, formal Italian. To look up the address of the town hall in the comune you are researching enter Municipio where it asks for Cognome. Sometimes I have used the word Municipale instead if nothing comes up for municipio or comune, or comune di or whatever else you can think of. You need to add ITALY at the bottom so that the Post Office does not become confused by the word Italia. A teller at the Post Office even asked me "where is Italia? what is it?" The teller next to her rolled his eyes and told her while I printed ITALY under the word Italia. The Registry (Census) Office = L'Ufficio Anagrafe. The Office of Vital Records is = L'Ufficio di Stato Civile. The person in charge is the Officer of the Civil Records: L'Ufficiale di Stato Civile. *It is not necessary to use the article "the" = "L" in the address. Lately I've been using "Anagrafe / Stato Civile"
Use this link to find the address of the Provincial Archives in Italy that handles the records for your comune of interest - OR- just do a search on a search engine or find the link in Wikipedia and / or in the Italian Wikipedia or simply try the Italian Phone Book using the links given on this page. The State Archives on Italy (Archivi di Stato) will have copies of many of the Civil Records of the Italian Comuni. The Archivio di Stato and Tribunale Court of each province in Italy are where the Mormons obtained their images of the records they put online on FamilySearch. Sometimes the Italian Archives have more years in their files and they also copies of some of the Italian Military Records or generally speaking at least the "Liste di leva" from about 1842 - 1909 or later if you are lucky. I have seen some listing their Ufficio di Leva holdings as comprising as many years as 1792 -1926. To check other "Patrimonio Documentario" not available from the comuni do searches on various search engines (including Italian search engines) for "Patrimonio Documentario". Most of the Italian State Archives have an official Historical Archivista (historical archivist) on staff, 'kind of like' our US National Archives (NARA) except in Italy they do not have a National Archive only Province Archives. On different days and for different churches I have found results by doing searches for - chiesa, chiesa cattolica, chiesa parrocchia, parrocchia and other variations. David Zerga recommended this phrase: Chiesa cattolica - servizi parrocchiali. For some reason all searches, on all days, do not get the same responses. I have been getting results by simply using by using the Italian White Pages: http://www.paginebianche.it/ and entering parrocchia in the space under "Cognome" and the name of the town in the space under "Dove"
Do not send money to Italy without asking first. The comuni (municipalities), provincial archives, and parishes in Italy welcome your financial contributions to cover their overhead charges. However, never send money to Italy without first writing the Italian archive to ask them for their fees. They are very reasonable and charge minimum for photocopies, postage & handling of each document, so ask them first. Pay Italy directly for your record requests, *after* they advise you personally of the cost. It's less expensive than hiring professional genealogists and gives you the knowledge of how to help others with your experience in doing your own Italian Family Tree Research.